Thanks to Deb Mager-Rickner and her students from Bristol Elementary I now have an appreciation for two new artists - Friedensreich Hundertwasser and Antoni Gaudi. Deb and her students recently shared with me these amazing lamps they made that include both the style and the spirit of Hundertwasser and Gaudi. I immediately started to research what it was about these two artists that inspired the amazing colorful lamps. I discovered that both artists would would have felt right at home in a maker space as they often combined their fascination with geometry with craftsmanship, environmentalist, philosophy, architecture, and engineering. The fact that Gaudí's first projects were the lampposts he designed for the Plaça Reial in Barcelona made the choice of a lamp project especially appropriate. As inspired as I was from the lamps created by these students, I was equally inspired by their teacher’s commitment to providing opportunities for her students. 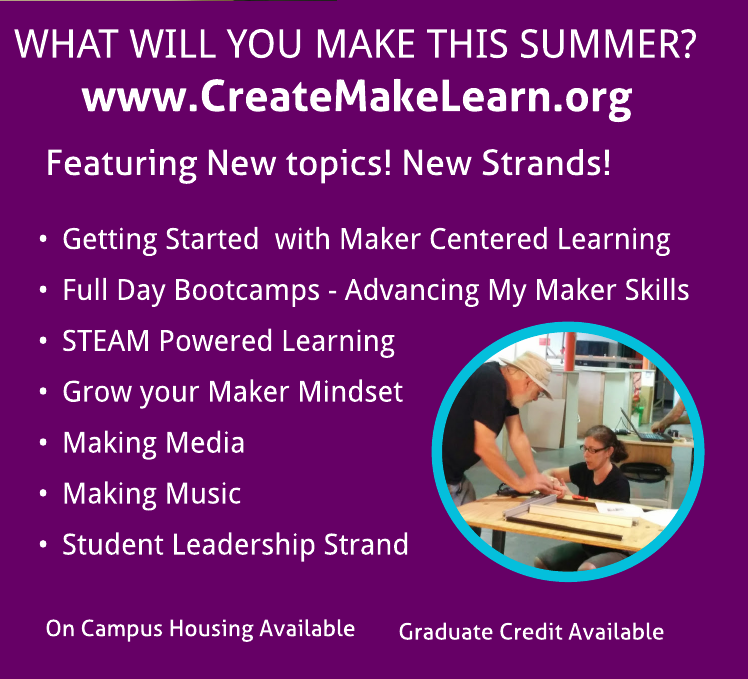 I remember the first time I met Deb at Create Make Learn Summer Institute. She was looking around for a place to stash her motorcycle helmet. I immediately knew she had an adventurous outlook on life and was not afraid to try new approaches. I also noticed throughout the week that she was always looking for ways that her students could benefit from what she was learning. Her approach to this project reinforced my first impressions of her as an educator. could use a pile of sona tubes that had been donated to her classroom. It was not long before she imagined them cut in half and as a base for her student’s next project! When lampshades turned out to be a bit more expensive than she imagined, she did not let that deter her and started visiting local thrift shops. There wasn’t a lampshade left in any of the local Good Will stores by the time she her students started painting their geometric shapes. The final obstacle was the cost of her the electric lamp kits (which turned out to be about $7 each.) 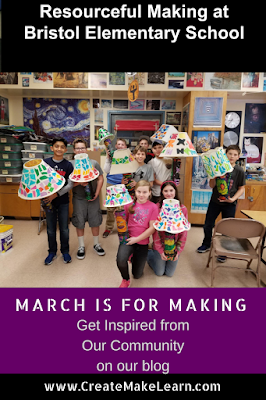 After approaching her PTO with freshly painted lampshades, she walked away with a PTO grant to cover the cost of ordering the electrical lamp kits on Amazon. Assembling the lamps provided yet another opportunity for her students to grow as makers. 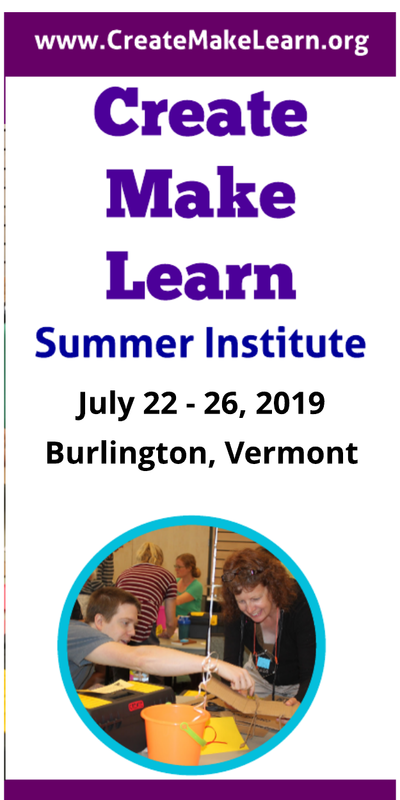 Most of today’s students don’t have experience with tools such as drills and screwdrivers, nor are they particularly experienced at following precise instructions as required in most assembly documentation. Finally, this project provides the perfect opportunity to include some of the thinking routine that Harvard Project Zero has put together as students grow their problem solving skills-- especially the understanding of parts, purpose, and complexities. The Thinking Routine - Parts, Purpose, and Complexities outlined in the work of Harvard project Zero is designed to increase students' ability to observe and ask questions for anything from everyday objects in their world to intricate systems like democracy. You can learn more about this thinking routine from Harvard Project Zero. Thank you to everyone from the Bristol community who collaborated on this project!